From only a constant earthcurrent the crop experiences no Lorentz force since the crop isn’t moving with respect to the earthcurrent’s magnetic field. When the earthcurrent consists of electrons then the ionized air tubes consist of positive charged molecules (ions). There is assumed a voltage between the soil and the air above. This voltage drives the electrons upward and the positive ions downward along their tubes. The molecules are heavy and large and their speed is very slow compared to that of the electrons. This can be regarded as a downward movement of the earthcurrent as a whole with respect to the surface of the crop. The electron’s upward velocity with respect to the surface of the crop then is diminished with the amount of the downward movement. This gives exactly the same result as an earth current that is standing still and the whole rest of the earth is speeding upward along it. 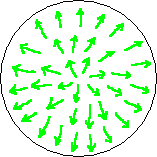 The crop then is moving with respect to the magnetic field of the earth current and will experience a radial forcefield (Lorentz force) which would down the crop radially. This is seldom observed. But in combination with a magnetic field that downs circular one could obtain a spiraled downed cropcircle and that is observed often enough. So we want to sum the magnetic field of a rising BoL and that of a rising earth current. That is possible. (see fig. 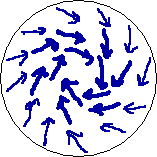 9.2) Normally we need to transform one of the two magnetic fields to a new magnetic field belonging to the velocity of the other field. 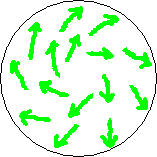 Remember we want to regard both magnetic fields to be motionless and then the crop falling downward with one velocity in this sum magnetic field. But in this case this isn’t necessary. From Fig. 8.3 en 8.4 we know the BoL will come to a standstill with respect to the earth currents’ magnetic field. That is the case when the velocity of the BoL (1) equals the velocity of the earth current (2). Now we add an alternating current to the earth current in just the same way as we did with the circlecurrent: the maximum of the alternating part doesn’t exceed the strength of the constant part. So the earth current will always stream upward, from the earth to the sky, and only differ in strength in the course of time. 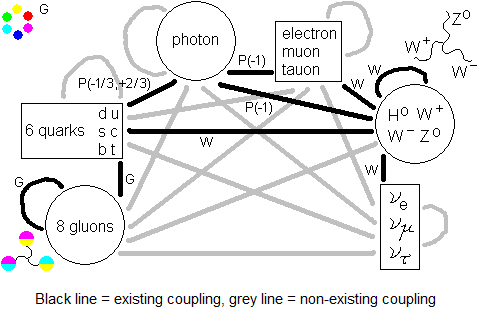 Maybe it is better to speak of a pulsed current since the current isn’t really alternating. It don’t have to be a regular alternating (we still speak of an alternating part of the earth current), nor in time nor in strength. One possibility immediately emerging is that the earth current may drive the circlecurrent by induction. We accept this to be so from now on; we have no better. If the strength of the earthcurrent varies between 6 and 10 (just illustrative numbers!) then the direct part has strength 6 and the alternating part varies between 0 (non-existent) and 4. One can think this decomposed too as a direct part of 8 and an alternating part that varies between -2 and 2, just like an ordinary alternating current: 8 - 2 = 6 and 8 + 2 = 10. The result is identical. 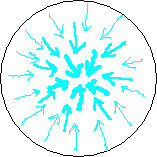 The direct part of 8 doesn’t contribute to the induction that drives the circlecurrent of the BoL. The magnetic field of the pulsed earthcurrent has a different strength from moment to moment, but it would at any moment keep its shape from fig. 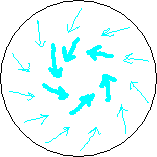 8.2; the magnetic field of a half-regular pulsed earthcurrent still consists of concentric circles. But it is emitting electromagnetic radiation then - computation and/or simulation is needed. In the mean time I have a more substantial proposal about what keeps the circlecurrent and the whole BoL in shape. That’s on the next page. 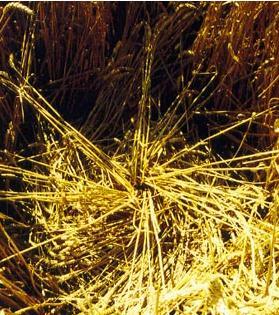 When the SuperBoL descends, first the most upper part of the stalk is spirally bent, then the middle part and then the lowest part. 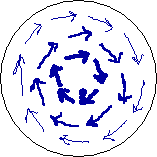 In doing so the stalk fold itself spirally around a torus. It is a birdsnest now! An Ordinary BoL shoots up from the soil to the sky. 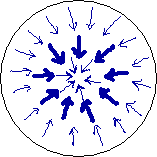 First the circle goes down clockwise, leaving a small tuft in the middle standing. Then a second BoL shoots up from the very same spot and downed the tuft, a star is born! 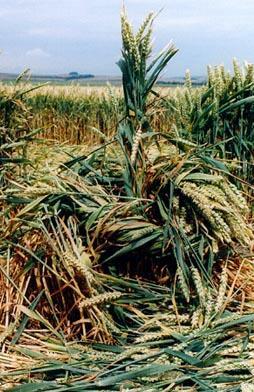 This star looks as radial downed crop, but a closer look at where the stalks originate learns they are downed clockwise along the circumference of a very small circle. The already laying crop beneath it got another push of their ions all over the stalk now and they curled up a little.